Walk to the river and downtown Bend only 4 Blocks! One block to a great market, coffee shops and bakeries and Bends finest restaurants. Listing 9070 means we have been with VRBO for decades! 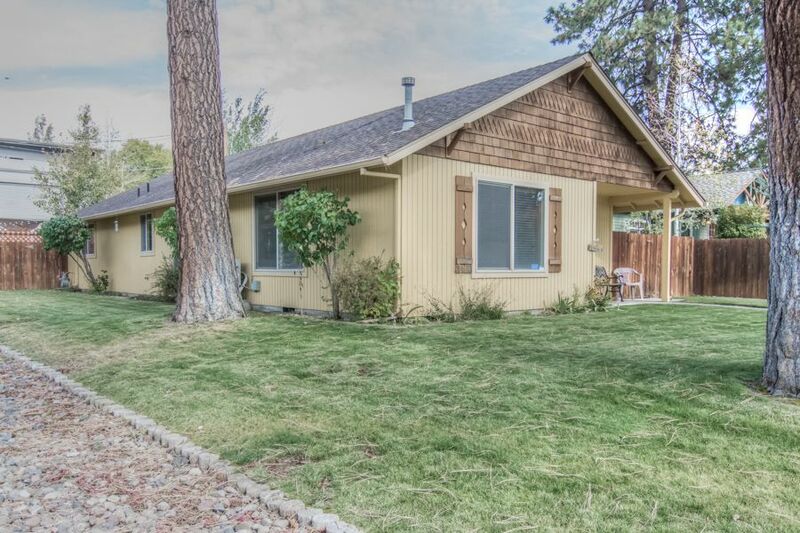 Three couples stay comfortably in this wonderful, downtown home on the West side of Bend , nestled in the tall pines. For your pleasure, relax in a romantic couples hot tub on a private back deck area, or cozy up by the natural gas fireplace in the great room or warm up in your own private Finleo sauna. Two, Brew Cruiser bicycles and a briquette or gas BBQ your choice, all to complete this West side dreamy vacation home. Walk one block to Newport Market with local fare, along with a top notch butcher shop, great produce and full deli. Bakeries, coffee shops, breweries, restaurants and so much more, all within 1 to 4 blocks. We are happy to supply complimentary Organic Coffee and local, hand crafted, goat milk body soap for you to enjoy during your pampered stay. Pillow top mattress king suite and two pillow top queen mattress bedrooms, with two full bathrooms await you. No hide a beds or twin beds for cramped sleeping at the Kingston. Super clean!! And we keep it that way. Two full bathrooms are unheard of in this mill house area of Bend, but the Kingston has two FULL bathrooms. too many restaurants to mention are all within 4 blocks to this home. May we recommend a safe walk three blocks to Chow, or Brother Johns or Spork for the best meals and local brews in town! Or prepare you meals at home in the well supplied kitchen. Plus our unique ABVH 'no cleaning fee' option is everyone's favorite! And ours too!! All ABVH homes (3) participate in the Pacific Power's Blue Sky renewable energy program. Energy efficient Mitsubishi ductless heat pump and AIR CONDITIONING keep this home warm in the winter and cool in the summer. Please, recycle during your stay. And no shoes allowed in the house. Fully-furnished vacation home. Thirteen hundred square feet three bedrooms, two baths, open floor plan. Gas fireplace, wireless internet, HD 42' big screen t.v/VCR/DVD player w/movies and cable with DVR, charcoal barbecue, private deck with hot tub and a washer/dryer for your use. We supply for your personal use all laundry soap, shampoo/conditioner/body soap, coffee maker with organic beans, grinder and filters, & blow dryers provided for short term stays. Single small car garage to store your gear, and the two bikes provided. Back parking area is fenced, secure and quiet. CLIENTS CHOICE FOR CLEANING FEE, either leaving the home in the same condition it was accepted (all laundry done and kitchen put back in order) with exception of final sanitizing, vac and dusting, or pay the cleaning fee of $150.00 for ordinary cleaning. Strictly no smoking of any kind on the property ANYWHERE. Owner managed by Absolutely Bend Vacation Homes. One small dog max. no cats permitted. Dog is not permitted on any furniture, bedding or left unattended in the home. Clients are responsible for any carpet damage or stains. PLEASE EMAIL US FOR UP -TO -DATE AVAILABILITY, AS THE ONLINE CALENDAR IS NOT ADAPTABLE WITH OUR WEBSITE. You can walk to the Newport Market only 1 block away. You can get a real sense of relaxation in this location surrounded by the huge pines and friendly neighborhood. Two full tub and shower bath rooms. Very nice , comfortable home with all the amenities and walking distance to restaurants, shopping and the Deschutes River. Dog friendly with area across the street for them to run. Definitely a place we would stay again. We rented this house over President's Day Weekend and it was great! The house was very clean and well maintained and it was within walking distance to downtown restaurants/shops. We came to Bend to celebrate a family birthday, this home was just perfect for us! Our son and his family were very comfortable in the large master bedroom with king bed! Perfect for two grandchildren who always manage to sneak into bed with their parents! Plenty of room! Everything was as described, beds were very comfortable and the neighborhood was quiet. It's easy walking distance to downtown. We were pleased to find everything we needed in the kitchen (and everywhere else for that matter) it was like staying in a friend's home. A problem with the cable television was quickly resolved by Chelsea, she really went out of her way. I've stayed in lots of rentals at the beach and the customer service here tops them all. The fenced yard was so nice for our dog and granddog. Loved the option to clean up after selves and save the cleaning fee. We agreed we would be happy to book the Kingston again only next time stay longer, the children didn't want to leave, there was more fun to be had! Thanks for a very pleasant experience. Susan we are happiest when our clients are happy. Come stay with us again soon! We think Chelsea is pretty special too! I rented the Kingston for 2 nights over Halloween with 2 friends and a dog. The location is absolutely perfect for a stay in Bend. It is walking distance to Newport and Galveston restaurants as well as downtown. The back yard is uniquely private with a 6 foot high fence and gates that close in your car so you can use the garage to store all of your sports equipement if you have it! There is a nice and large hot tub deck with beautiful overhanging lights and a nice spot to sit in the sun and lounge in lounge chairs. The garage has a sauna inside and plenty of space for paddle boards. The inside was great too!!! There were high ceilings and 3 large beds! The living room, kitchen, dining room area was all connect for a nice large great room wonderful for socializing! Washer/dryer was nice! The owner was very accomodating to me having my well behaved dog with me! I would absolutely stay here again!!! We look forward to your return! Thank you for choosing Absolutely Bend Vacation Homes. We have stayed at the Kingston House for the past nine years. We enjoy the house and feel at home during our stay. Typically we stay for at least one month a year. The location (West Bend) is ideal for enjoying the down-town Bend area and is an easy walk to Drake Park. There are also some great spots on Galveston Ave for good food and drinks. The house is well maintained and has had major improvements almost every year, such as a new deck and hot tub, new carpets, and new appliances. Any issues or concerns we have had over the years were quickly resolved by Chelsea and her family. The Kingston House has been a great place to stay, with an ideal location at a reasonable price. We are always happy to see a familiar smiling face. Thank you for choosing our home over all the others. We love the Kingston home and we are so pleased you do too! We had a great first stay at the Kingston and look forward to coming back. It is in our favorite location in Bend. Walkable to great food and beer, and convenient driving to the local trails for mountain biking. The space worked out great for two young families with small kids and dogs. Thank you Paul! We look forward to your return. No Cleaning fee option like to other! See our website for complete details. No additional fees for your dog.